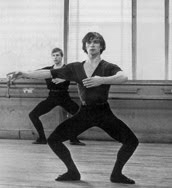 The past few weeks I have been reading Julie Kavanagh's biography, Rudolf Nureyev. Today is an apt day for posting this blog as it would have been Rudi's 72nd birthday. When I was a teenager, everyone else I knew had posters of the Beatles or the Rolling Stones on their walls. I had a dozen different posters of Rudik. He was a huge and charismatic presence and, even 17 years after his death, he still seems to be here among the living, one of those rare people you can't quite believe still does not walk (dance) this earth. Born in 1938 on the Trans-Siberian Railway, he was constantly performing, choreographing, teaching. He had a huge intelligence, educating himself about everything from Byron's poetry to how to spot the best kilims. He worked endlessly, pushing his body to extend his repertoire and technique. From 1973 until his death in 1993, Kavanagh writes "Rudolf had been dancing with a permanent tear in his leg muscle; he had destroyed his Achilles tendon by years of landing badly; he had heel spurs; his bones were chipped so that even basic walking gave him pain." None of this stopped him from his passion of performing. One of the many ballets he left his stamp on was Kenneth MacMillan's Romeo and Juliet. If you want to see the final heartrending scene with Margot Fonteyn, watch this YouTube clip and weep. Stay tuned . . .